This part of the site has sections on Conservation in general, Mistletoe distribution in Britain and beyond and Biodiversity value of mistletoe. Mistletoe conservation initiatives have become much more common in Britain in recent years, largely due to concerns over loss of mistletoe quantity as apple orchards have been lost, mistletoe’s general rarity in much of the country, new interest and discoveries in mistletoe’s scarce insect associates and a general belief that mistletoe is a symbolic plant useful for raising awareness of conservation issues. Other mistletoe species around the world are also the subject of conservation concern – many linked to their complex relationship with host trees and with specialist animal and bird associates. Mistletoe conservation has to be seen in context though. For some mistletoe species mistletoe control can be as, or more, important. Often conservation and control need to be considered together – in Britain we have a need for both, often depending on geographic and habitat location. A number of formal mistletoe initiatives in Britain are described here – but this is not an exhaustive list. Nearly every winter season there are new announcements about mistletoe projects, some really well-thought through, others rather less so (and possibly largely undertaken merely for promotional purposes!). The National Trust/Orchard Network’s Mistletoe Campaign encouraged people to help secure the future of mistletoe in its heartland by buying sustainably sourced home-grown mistletoe in the run up to Christmas and the season of office parties. The campaign also encouraged shoppers to ask where the mistletoe they buy has come from. Butterfly Conservation, the charity championing butterfly and moth conservation, have taken a lead in researching, documenting and promoting the Mistletoe Marble Moth, which is a Priority Species in the UK Biodiversity Plan. Their factsheet on the moth is available here. The relative rarity of mistletoe in much of Britain made it a contender for inclusion in several local Biodiversity Action Plans (BAPs). It has never been a major part of any plan, but several counties and boroughs did include it in the original round of local plans in the 1990s. New mistletoe planting in Downe community orchard, near Darwin’s Down House, as part of the London Mistletoe Plan. Darwin was a great admirer of mistletoe’s adaptations. Most effort was put into the London plan – both at Greater London and Borough levels, with a programme to document populations across London (only significant in Richmond in the SW and Enfield in the NE) and to introduce new populations in key managed areas. The species was included on account of its rarity, cultural significance and ease of monitoring. Several new populations were started in some fairly famous locations – though, pending ongoing monitoring, I’m not naming all those just yet. Monitoring of some of the existing populations, notably those in Richmond, have helped to document the apparent increasing spread of some mistletoe populations in the south-east. Tenbury Wells on the Worcestershire Herefordshire border, is the centre of the traditional UK mistletoe trade. The mistletoe sold is harvested from the many apple orchards of the area, and so continuing availability of mistletoe – which means continuity of orchards and management of mistletoe – is essential. The Mistletoe Festival was established in 2004/5 to help promote the traditions of mistletoe trading in the area, and, by extension, to conserve the orchards and mistletoe. Though not a direct conservation project the Festival has been perhaps the highest profile element in mistletoe promotion nationally in the last few years. In the 1990s a national project to re-map mistletoe across Britain was run jointly by the Botanical Society of Britain and Ireland and Plantlife. 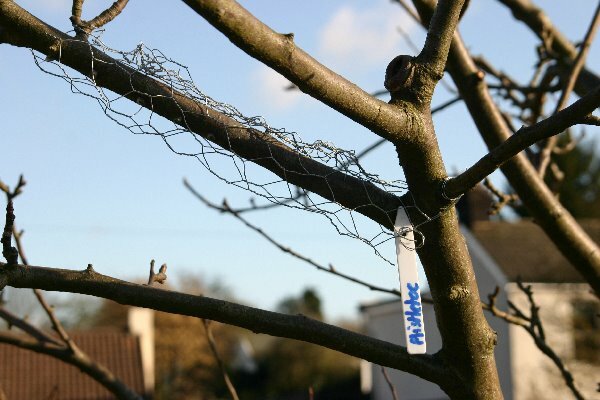 The project aimed to assess the impact of apple orchard loss on mistletoe, comparing data to the similar survey carried out in the 1970s by the BSBI. This became a very high-profile project, attracting huge public interest, and perhaps accounts for some of the high ongoing interest in mistletoe conservation today. For more information on distribution and survey results visit the Distribution page.